Rachel Barlow is the Common Thread Artist for March. 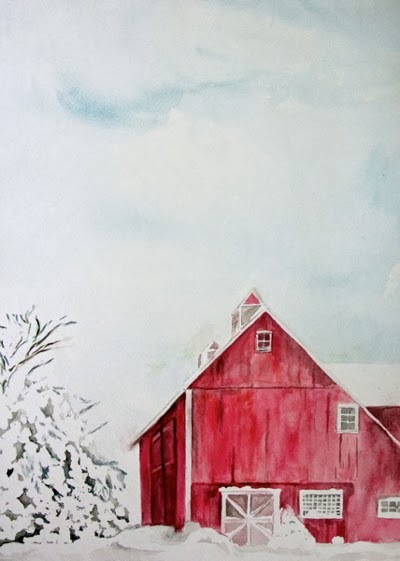 She is giving away a print of her Ice Pond Barn. It is beautiful and would be lovely hanging on your wall! Rachel Barlow is a busy wife and mother of two boys, and lives on what she calls a homestead instead of a farm in Vermont. She is "a transplant" to Vermont, though it doesn't take long to know that anyone who lives here has common bonds: a love for maple trees and syrup and some practical knowledge about rural living. Rachel's stories about raising her Thing 1 and Thing 2 bring back the memories of raising our two girls here in Vermont. It is a great place to raise kids. Do check out her writings and art work on her blog, Picking My Battles. Being in Vermont is to be rooted in family and stories. Rural living is a grounded way of life and you will enjoy Rachel's writings that speak to values of love of family and the beautiful countryside that surrounds us. I just visited her sight and was intrigued by the picture of her husband's great grandmother, Alice Little Fox a native Vermonter and native American Mohawk Indian. I was fascinated by the picture and Rachel's story about her! Family stories are precious and like she said, two headstones with names tell so little about the bridges that brought them together. I too am interested in those that went before me. I am finding that some of my ancestor's traits have somehow reached me. It is in my gene pool, no doubt, though I always believed that we were more products of our environment. That is questionable after seeing a grandchild who doesn't like peanuts in his chocolate, just like his grandfather, or a granddaughter who loves sewing just like her grandmother and great grandmother! There is more than the shape of a nose that gets passed down. Rachel's writing about Alice Little Fox is so appropriately entitled, The Way we Are. How much of who we are is really written in the stories of our ancestors! Read more of Rachel's stories on her blog and to register to win her free give-away drawing by just going to her website and leaving her a message any time from Tuesday through Thursday. A winner will be selected on Friday and all Common Thread Artists will post the lucky winner at the end of the week.